CommuteWorks is dedicated to helping the LMA go green by rewarding existing carpoolers and helping LMA employees create new carpools. Your ridesharing efforts can earn you up to $250 towards gas plus other great benefits and rewards! 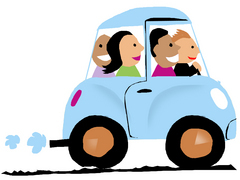 All Carpools enrolled in our incentive program must operate at least twice per week. Also, only one person in the carpool can have a valid parking pass at a MASCO institution. NEW BONUS! - once the carpool completes the incentive program, all individual commuters are encouraged to enter the Rideshare Loyalty Program! In addition to registering your carpool with CommuteWorks, all carpool members should register with www.baystatecommute.com/commuteworks in order to receive additional rewards. Need help finding a carpool partner? Download the Bay State Commute App! Bay State Commute is a leading ride matching system that allows commuters to quickly find carpool partners while also providing incentives to people who rideshare or use other green modes of commuting. Once you register with Bay State Commute, you can instantly view other potential carpool partners who share the same commute as you. As soon as you establish your carpool, you will be eligible for CommuteWorks’ Carpool Incentive Program. Did you find this website helpful? If looking for a carpool partner, were you able to find one? Love carpooling? Encourage a colleague to join our Carpool program and be rewarded with a $25 amazon gift card.